Box Tops for Education is a nationwide initiative that helps parents earn money for their children’s schools by clipping the familiar pink Box Tops coupons from hundreds of products; more than 90,000 K–8 schools participate, and more than $74 million was raised for schools in the 2011-2012 school year. In this special edition of the classic Betty Crocker Cookbook, Betty Crocker teams up with BTFE to offer fun and delicious ways to earn money for your school. 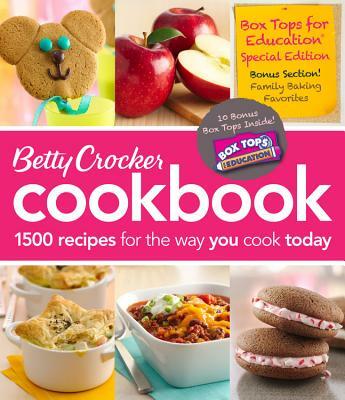 It includes the entire 11th edition of the Betty Crocker Cookbook, with 1,500 recipes and 1,100 photos, plus a specially designed bonus section of scrumptious baked treats—such as Brownie Pops, Yogurt-Bran Muffins, and Baseball Game Cupcakes—many of which are ideal for making with kids. Each new recipe indicates the Box Tops products used and number of coupons earned. The book also highlights the best products for collecting Box Tops any time you cook, and even comes with 10 Box Top coupons. With more than 63 million cookbooks sold since 1950, Betty Crocker is the name readers trust for reliable recipes and great ideas. For over 75 years, Betty Crocker has provided advice to millions of Americans through cookbooks, magazines and television.